While Saturday’s rally in Central Jakarta celebrating the tenet Bhinneka Tunggal Ika (‘Unity in Diversity’) failed to pull a crowd as large as the rally calling for Jakarta’s governor Ahok to be jailed for blasphemy in the same spot just over a fortnight earlier, it was thankfully a calmer affair. The rally (not necessarily held in support of the candidacy of Ahok, who rose to power in late 2014 after serving as deputy to then-governor and now-president Jokowi) promoted unity and tolerance in the face of a blasphemy case that has divided the city and threatens to sink the re-election of Jakarta’s first ethnically Chinese-Indonesian and first Christian governor. Indonesia’s blasphemy laws ostensibly protect the freedoms of the country’s six officially recognised religions (Islam, Catholicism, Protestantism, Hinduism, Buddhism and Confucianism) but are far more frequently used to target minority sects, particularly fringe Islamic groups such as the now defunct Gafatar group. Andreas Harsono from Human Rights Watch told the Guardian most named suspects eventually see jail time, with the researcher recalling just one case in which the suspect was acquitted. A video of the speech, posted to Facebook by university lecturer Buni Yani (who may face his own set of charges after the editing of the tape was questioned) quickly went viral, leading to demands for Ahok to apologise. He did just that in early October, releasing a statement saying he never intended to insult either the Quran or Islam, and apologising for any offence. Sensing weakness in the clear frontrunner in next February’s poll, key political opponents (particularly former president Susilo Bambang Yudhoyono, whose son Agus Yudhoyono is running against the incumbent) began drumming up outrage and demanding legal consequences. When a 14 October rally in Jakarta, hosted by a coalition of hard-line and conservative Muslim groups and led by the Islamic Defenders Front (FPI), failed to generate the hoped-for waves, the groups vowed to return bigger and better on 4 November. This evidently did the trick, with the week preceding the demonstration’s scheduled full of drama. President Jokowi visited his election opponent and Gerindra Party chairman Prabowo Subianto at his West Java ranch, where the two made a show of unity in calling for a peaceful, non-violent rally and inexplicably rode horses while wearing cowboy hats. Meanwhile, the National Police announced Ahok would face questioning over the charges on 7 November (the Monday following the scheduled date of the rally). If the motivation behind either event was to stem the flow of protesters, they both failed miserably, with 100,000 people flocking to Central Jakarta. Despite the mammoth crowd and concerns Islamic State sympathisers would co-opt the day for their own ends, it largely went smoothly until nightfall, when protesters refused to move on after the 6 pm finishing time. Violent skirmishes between protesters and police at the Presidential Palace and the Parliamentary Complex in South Jakarta were aimed at the president, with some chanting ‘Topple Jokowi!’. Rioting and looting in predominantly Chinese neighbourhoods near Ahok’s residence in North Jakarta brought the racial undertones of the demostration to the fore. The witch-hunt (which received a major boost from the official naming of Ahok as a suspect) has prompted much soul-searching in Jakarta; opinion is split over whether it’s indicative of genuine Islamisation or just a particularly grubby campaign exploiting racist and xenophobic elements of Indonesian society for political gain. Conservative Islamic-based laws such as those targeting the LGBT community continue to be benched, political leaders continue to kowtow to Muslim interest groups (particularly the powerful Muhammadiyah and Nahdlatul Ulama organisations), and gaping failures to adequately address extremism are well-documented. 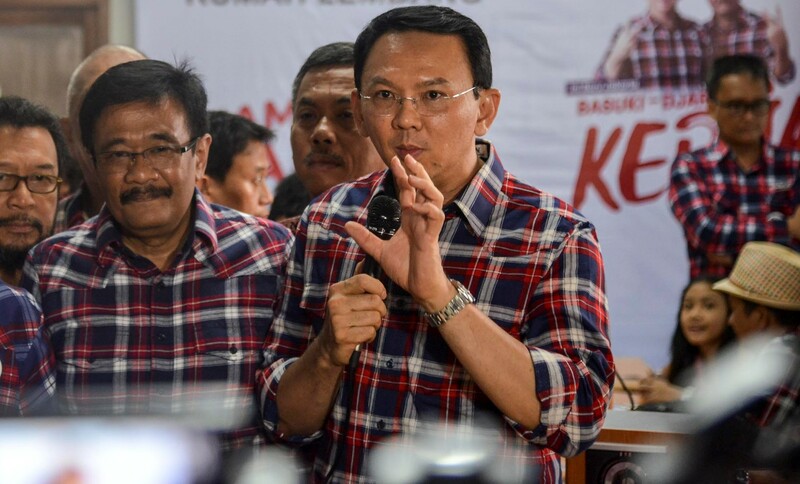 But to claim a case such as Ahok’s is the inevitable result of creeping Islamisation in Indonesia ignores the political realities and nuances of the gubernatorial race. The three-way poll features tropes familiar to Indonesian elections: the next stage of a dynasty, via Agus Yudohoyono, and establishment meeting business through the former minister Anies Baswedan and businessman Sandiaga Uno’s joint ticket. Despite a short career in regional politics prior to reaching the capital, Ahok is an outsider. Amplifying what it is that makes him an outsider (his ethnic and religious background) is a cynical and transparent attempt to highlight those differences for votes among certain portions of the electorate. This tactic may well work, with one small poll showing the incumbent’s numbers tanking in the first week of November. *This piece originally used the tranlation 'not be fooled by Al-Maidah verse 51’.